The number of plates sold directly relates to the amount of funding available for spay and neuter surgeries. Please help us sell the plates for the animals! Email us at info@massanimalcoalition.org to become more involved with marketing the plates. We are happy to send you hard copy flyers and rack cards via snail mail, or you can download and print them yourself! Tailgating Video Link or watch it below! Distracted Driving Video Link or watch it below! Add the Animal Friendly License Plate image to your website or newsletter! 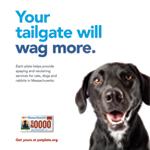 Look at License Plate information/blurbsUse in websites, blogs, Facebook or Twitter profile, and share your support of the Animal Friendly License Plate! If you need a specific sized image, please email us for exact specifications, including ads for different specifications (i.e. 1/8 page ad, etc) email info@massanimalcoalition.org. for newsletters, website, etc.of different lengths – for you to use in your advertising. We have flyers (and holders) and posters. We also have banners and other material for borrowing for dog walks and other events. Please e-mail us at info@massanimalcoalition.org to request materials. Click here for a list of ideas, including places to distribute these flyers and other ways to get them into the hands of people who will purchase them. Do you work with or for a veterinary clinic? Click here for ideas about how you can help by displaying information in your facility. Our PSA on the plates.